For many of us, just saying the words “annual review” accelerates our heart rate a few beats. But the best way to lower the pressure is to focus today on what to do BEFORE your annual review. And while it’s trendy for companies to talk about shifting from annual performance reviews to continuous feedback, most companies still have an annual process, especially to evaluate changes in pay. So, the annual review still matters. How can YOU make the most of it? Use these four strategies and their scripts so you’ll know what to ask, what to say, and what to do before your annual review this year. Preparation, it’s said, is the antidote to fear. So how can we best prepare ourselves for an annual evaluation by our boss, often including the opinions of others? You can be the person who asks for feedback all the time. Well, maybe not every second out of every day. That feels a little desperate. But asking for feedback after major meetings, deadlines, and deliverables–those are perfect times to ask other’s perceptions of your work. There’s nothing more frightening than being surprised with negative criticism in a review. You can prevent being surprised by making sure you are constantly inviting people around you to share ideas and observations about your performance and habits. But if you focus on specific, targeted requests, your colleagues will respond with smarter, more honest answers–answers that can help you be more aware of how you can improve. After you ask, shut up and listen. If the feedback indicates there are things to improve, resist the urge to defend, argue, or counterattack. Just listen and say thank you. Again, just say thank you. Asking for–and listening to–someone else’s opinion does not mean you have to automatically agree, or do what they suggest. It’s just data to consider. When you’re ready, you can mash the data against what you know to be true for you–your goals, your values, your superpowers. You can notice the themes in common, or what seems to be perceived differently with different people. Ultimately, you can decide for yourself whether you want to make any changes or improvements, or whether you just want to be ready to help others understand why you choose to do things the way you do. Most people are afraid to ask, thinking they don’t want to know what someone else thinks or feels. But you’re not most people. Put on your red cape, and start being the person who asks for feedback, always. What’s the best predictor for a successful performance review? It’s not the fact that you rocked the corporate world this year with your amazing sales, your talented creations, or your heartfelt leadership. In fact, the worst thing that can happen in a review is that you walk in thinking you are a shooting star, and walk out feeling like a black hole. But that’s not going to happen to you this year, because you’re going to do the one thing that can help you get ready. You’re going to know what to expect. As before, preparation is the antidote to fear. When we know what to expect from the process, our manager, and even potential content of our review, we take control and can be better prepared about what to do before our annual review. Here’s the ABC’s of where to start. a. Ask your manager, or whoever will conduct your review. I’m surprised by the number of people who talk with their manager about every little project and process, but never take time to ask about the annual review process until they’re headlong into the conversation. [After you get the overview] I understand how our process is designed to work, but I know we live in the real world and sometimes things shift for speed or resources. Are there any workarounds or informal steps people in your role end up taking to work through the process more effectively here? What are the one or two things I should expect from the annual review conversation we’ll have? What should I not expect? What do you need me to do in advance to make sure we have a productive review conversation? I know I’ve been through an annual review with you before, but I also know lots of processes are changing in our business. I’d like to make sure my expectations are in line for how it’ll work here this year. Can you walk me through the steps and what to expect? A good boss will appreciate your curiosity and desire to know. A mediocre boss will be forced to think through the process further in order to share it out loud. That’s good. And a bad boss, well, let’s hope he or she can just learn by your example, but that’s why you keep asking others. b. Ask your human resources (HR) person. HR has gotten a bad rap in recent years, as its practitioners have been forced to wear the black hats of layoffs and cost-cutting. But most HR people I know actually want you to remember they have the word “human” in their title. Yes, they want to help. You likely have an HR person who serves your company, department, location, or division. They may be on the other end of a phone rather than down the hall, but they’re there. Don’t assume they can’t help just because you’ve heard that grumble from others. There are awesome HR people and there are stinky HR people, just as there are awesome and stinky IT pros, financial managers, and professional coaches. Here’s what to ask an HR pro in your company. Overall, what are the steps of the annual review process in our company? In your experience, how closely does each manager follow that process? If my manager does something different, is that a concern? When does the process kickoff, and when does it need to be completed? Does our process typically include conversations about my pay, or is that handled in another conversation? If the conversation includes pay, will I also hear about any other rewards (such as bonuses or incentives)? If the conversation doesn’t include pay, what is the timing and process of conversations about pay? Who is involved in my evaluation and review? What forms get filled out? Who sees those, and do I get a copy? In general, do we rate or rank employees against each other here? If so, what do those ratings or rankings mean? Will I be asked to sign something confirming I agree with the review? Will we be setting goals for the next year, or is that handled in a separate conversation? Will we be talking about specific skills to grow and develop? c. Ask a senior, trusted employee in your company. What’s a person to do to find the truth? You’ll gain valuable insight when you ask another employee who you respect and trust, and who has been through the company’s processes several times in the past. Ask your colleague about the process from scratch, using the same questions above. Then, query them on the inconsistencies, asking them for their theories, or what they do or don’t do about them. It can be a great conversation to really cement what you can expect from your annual review–and what you shouldn’t expect along the way. Yes, you can learn to brag so that others don’t gag. Knowing what you have to brag about–what you’re proud of, what you’ve contributed, how you’ve made a difference-is especially important to have organized before your annual review. Write it in your own words. At first, no one needs to see it except you. Say what you did in the way that really tells the story–not in corporate speak! Write down e-v-e-r-y-t-h-i-n-g that comes to mind–not just the things others might say are accomplishments. It doesn’t matter how big or small the accomplishment–write it down. If it’s important to you, it’s important. For example, if you kept yourself composed during the monthly marketing meetings while being questioned within an inch of your life, write it down. If you finally spoke up to the jerk who keeps questioning you in the marketing meetings, write that down, too. Park any shyness, censorship, or hesitation at the door, and say all the great things about you that you wish someone else would say. This year, I was proud to be able to . . . It was a great working experience when I . . I grew so much when I . . . . I really put my past learning into action this year when I . . . I did my best work when . . .
Life really rocked after I . . . The brag list gives you clarity around the situations that worked best for you this year. It helps you build confidence around your accomplishments. It also helps you get your success stories into words that you can use when you need them, whether at your performance review or at any other time. If you get stuck .. .
As Ferris Bueller said, life moves pretty fast . . .
Review your calendar. Where you spent your time tells you oodles about what’s been important across the year. Do a quick email scan. I’d set a timer and limit yourself to about 10 minutes of this lest you get sucked into email cleanup or discovering loose ends that no longer matter. If you actively use LinkedIn (and of course, you should), review your profile for things you’ve shared. What you talked about in cyberspace may be what you should still be talking about now. Pretend you are writing a recommendation for your best friend— that friend just happens to be you. What great things would you brag about for that friend? After all, you’ve been there to witness all the hard work—and hopefully to celebrate the successes. It’s time to start your brag list today. In fact, it’s helpful to keep it up all year-long, adding to it once a month (make this brainless and set an repeating appointment on your calendar). Remember, you’re doing great things. Let’s keep track of them so you can remind others of them before your next annual review. Does your annual performance review quickly degrade into running down the a checklist of tasks you and your boss haven’t discussed in a while? Do you long for a big, meaty, insightful conversation, but end up with a ho-hum information exchange that could have been communicated in email? If that’s the case, it’s time for you to initiate the talk before the talk. And often, it’s not the right place to START a conversation about your career growth, promotability, or your achievements. Rather, it’s a great place to CONTINUE a conversation you’ve already intiated. Yes, it’s your job to initiate the talk before the talk. Not your manager. Even if you’re blessed with an amazing manager or leader, they–like you–are probably busier than ever. And so if you want attention to what’s important to you–like your advancement or growth opportunties–it’s up to you to create time for those conversations and plant the right seeds, long before the officialness of the annual review. If your boss isn’t already scheduling—and keeping—a regular check-in meeting with you, invite her to catch up at least a month before performance review time. Also, remember how you don’t want any surprises in your annual review? Well, your manager is the same way. Springing a fresh topic or ask during the annual review can be an unpopular–and unproductive–strategy. Don’t wait for others to tell you what or when–start talking before it’s time to talk. You’ll take back the control you need –and you’ll be better positioned to bring your superpowers to work. How about you? 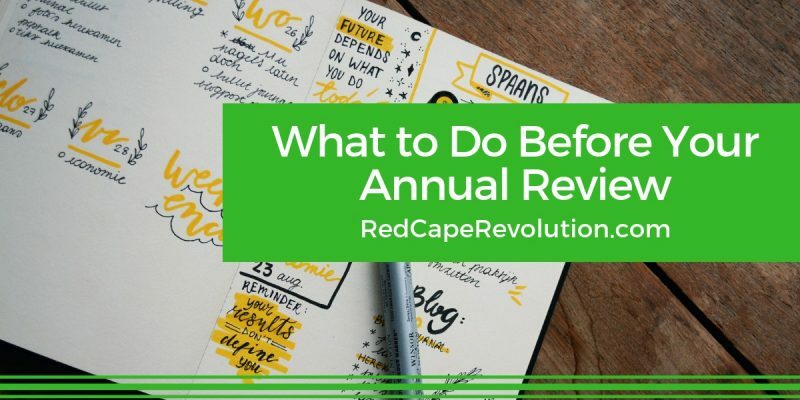 What do YOU need to do before your annual review? You can reach me confidentially here–I always love to hear your stories and ideas.